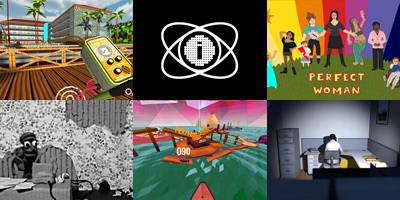 This year's IGF finalists. The IGF Awards take place on the evening of the third day of Game Developers Conference, and are a major celebration of the best in indie gaming, with thousands watching the award presentation before the Game Developer's Choice Awards are presented. The 2013 IGF Awards, including custom interstitials from Mega64, are available for online viewing. The Festival Awards will take place March 19, 2014. Anyone can attend the ceremony. The IGF Awards take place on the evening of the third day of Game Developers Conference, and are a major celebration of the best in indie gaming, with thousands watching the award presentation before the Game Developer's Choice Awards are presented. The 2013 IGF Awards, including custom interstitials from Mega64, are available for online viewing. The Festival Awards will take place March 19, 2014. Anyone can attend the ceremony. Honorable mentions: 868-HACK (Michael Brough); Crypt of the NecroDancer (Brace Yourself Games); Kerbal Space Program (Squad); The Yawhg (Damian Sommer and Emily Carroll); and TowerFall Ascension (Matt Thorson). Honorable mentions: Don't Starve (Klei Entertainment); Galak-Z (17-BIT); Shelter (Might & Delight); The Swapper (Facepalm Games); and The Yawhg (Damian Sommer and Emily Carroll). Honorable mentions: DEVICE 6 (Simogo); Gorogoa (Jason Roberts); Perfect Stride (Arcane Kids); The Banner Saga (Stoic); and Threes (Asher Vollmer, Greg Wohlwend, and Jimmy Hinson). Honorable mentions: Don't Starve (Klei Entertainment); Jazzpunk (Necrophone Games); Potatoman Seeks the Troof (Pixeljam); Sokobond (Alan Hazelden, Harry Lee, and Ryan Roth); and The Banner Saga (Stoic). Honorable mentions: Detective Grimoire (SFB Games); Gorogoa (Jason Roberts);Monster Loves You! (Radial Games Corp. & Dejobaan Games, LLC. ); Quadrilateral Cowboy (Blendo Games); and Redshirt (The Tiniest Shark). Honorable mentions: 18 Cadence (Aaron A. Reed); DEVICE 6 (Simogo); Elegy for a Dead World (Dejobaan Games with Popcannibal); Shelter (Might & Delight); and SUPERHOT (SUPERHOT team). Honorable mentions: Bokida (Institut de Création et d'Animation Numériques); Flying Fish (The Academy of Interactive Entertainment); Ladylike (NYU and NYU Poly); Rabbit Rush (RMIT); and UN EP (Kansas City Art Institute).